Mark Wood's dream Test comeback, Stuart Broad's stunning catch and two batting collapses... all you need to know from day two in St Lucia. Mark Wood claimed his maiden Test five-wicket haul to put England in a dominant position against Windies on day two of the third Test in St Lucia, writes Kalika Mehta. In his first appearance of the series, the fast bowler took 4-37 in an initial exceptional eight-over spell, having Shai Hope (1) and Roston Chase caught at gully off consecutive balls before seeing Darren Bravo (6) and Shimron Hetmyer (8) edge him straight to Joe Root at slip. And, it took Wood just two balls into his new spell to pick up his five-for, hitting the base of middle stump to see the back of Shannon Gabriel to finish with career-best figures of 5-41 - with the Windies bowled out for just 154. Spinner Moeen Ali played an equally pivotal role, taking four wickets to rattle through the hosts' batting line-up, dismissing openers Kraigg Brathwaite (12) and John Campbell (41) in successive balls and accounting for Keemo Paul and Alzarri Joseph as Windies lost all 10 of their wickets for just 97 runs. England had suffered a disastrous collapse of their own in the first session, adding one run to their overnight score before losing 6-45 to be bowled out for 277, Kemar Roach picking up 4-48. But in their second innings, the visitors' openers Rory Burns and Keaton Jennings saw out a tricky 10 overs to end the day 19-0 - a lead of 142. Although Moeen Ali began the England recovery with two wickets in successive deliveries, it was Mark Wood who really wrenched the pendulum back in the tourists' favour by repeating that feat. The Durham seamer, playing in his first Test for nine months, immediately unleashed the genuine pace and accuracy England have been lacking for most of this series. 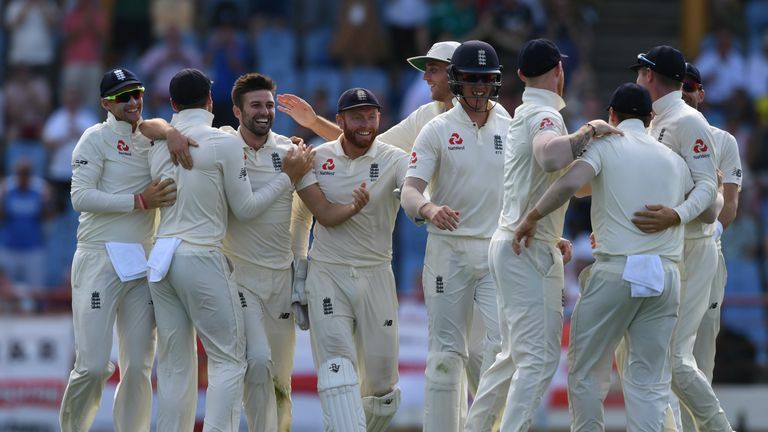 Wood's astonishing spell of 3-12 just before tea, to remove Shai Hope, Roston Chase and Shimron Hetmyer in the space of 15 balls, tore the heart out of the Windies batting and suddenly made England's total of 277 look formidable. Stuart Broad also provided an eye-catching moment with his back-pedalling one-handed catch to dismiss Alzarri Joseph and hasten the end of the home side's first innings. England seamer Mark Wood's figures of 5-41 were his best in any form of international cricket. John Campbell and Kraigg Brathwaite's stand of 57 was Windies' fourth opening partnership of 50-plus in the series - the first time they have achieved that since 1991. Until this series, only four batsmen had hit James Anderson for six inside his first 10 overs of a Test match. Windies opener John Campbell has now achieved that feat in successive matches. 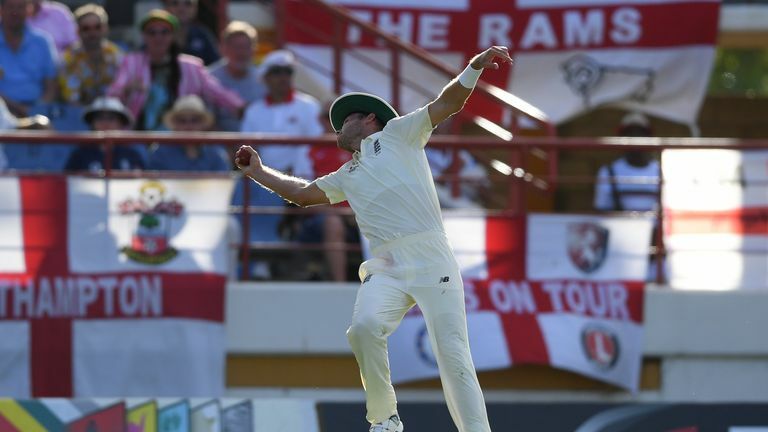 The immediate impact made by Mark Wood, more than halfway through day two in the final Test of the series, inevitably raised the question of why it had taken so long for England to entrust him with the ball. Olly Stone was originally meant to be England's wild card in terms of pace but, once he was ruled out through injury, Wood was drafted into the squad… and left kicking his heels on the sidelines. Seasoned observers have said it time and again during this three-match series - England needed a bowler who could hit the deck hard and fast, much in the way Shannon Gabriel has done for the home side. Yet the selectors bizarrely opted to leave out Stuart Broad in Barbados, putting their faith in the diminutive Sam Curran top open the bowling and ignoring the claims of Wood until the series was lost. Mark Wood: "I think of all the hard times I've had with injury and a lot of self-doubt, actually - whether I was good enough to be at this level. Today I've felt like an England player. "I felt I actually merited my spot here - this time I wasn't picked on potential. I'll never forget today and any time when things aren't going right I can look back on this game and have fond memories. "Obviously when you get a wicket in the first over, the adrenaline's flying. I didn't really want to come off at teatime and stop the momentum but I probably bowled two overs too many in that first spell." Nasser Hussain: "It (Mark Wood's earlier omission) shows the naivety in selection leading up to this series - it was almost like trying to reinvent the wheel. Go back to the basics of Test match cricket - frontline batsmen and frontline bowlers. "Don't get all-rounders doing jobs frontline bowlers and frontline batsmen should do. "You can argue about the personnel but in this game, England have three frontline batsmen before Root and three frontline bowlers before Stokes gets the ball. Boy, did Wood give them a burst!" Rob Key: "Kemar Roach's stats are unbelievable - 17 wickets at 12 in this series. Yes, he has had some decks with something in them but he has given no let-up to England's batsmen. "Once the seamers get on top I can't remember too many bad balls. There were a few deliveries yesterday that were real legside wides, but even the young bowlers that are coming into the game have so much control. "The way they put every batsman under pressure, it is really good for Windies cricket."